Order in the next 1 hour, 2 minutes an 9 seconds for same day shipping. 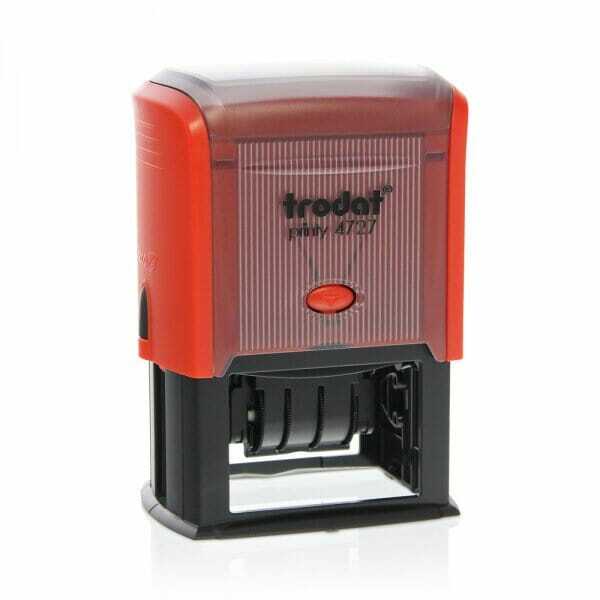 The self-inking Trodat Printy Dater 4727 rubber stamp can be personalised with your message. The date has a height of 4 mm and the format: day, month (in letters) and year. The stamp creates a rectangular impression that measures 60 x 40 mm, which can include a maximum of 6 lines of personalised text alongside the printed date - 3 lines both above and below. As standard with all Printy dater stamps the 4727 is supplied with a built in dual colour blue and red ink pad - blue text and red date. To further extend the life of your stamp, order the suitable replacement ink pad 6/4927 - available in black, blue, red, green, violet - or 6/4927/2 two-coloured blue/red. Dry felt pads are suitable for special inks. Customer evaluation for "Trodat Printy Dater 4727 60 x 40 mm - 3+3 lines"